Right here in the heart of summer, we've got a hot show foryou. The August edition of Chicago's eclectic monthly reading series will feature Hannah Gamble, David Daskal, Christine Simokaitis, Britt Julious and Leah Thomas. Andrew Huff and Eden Robins cohost as usual. 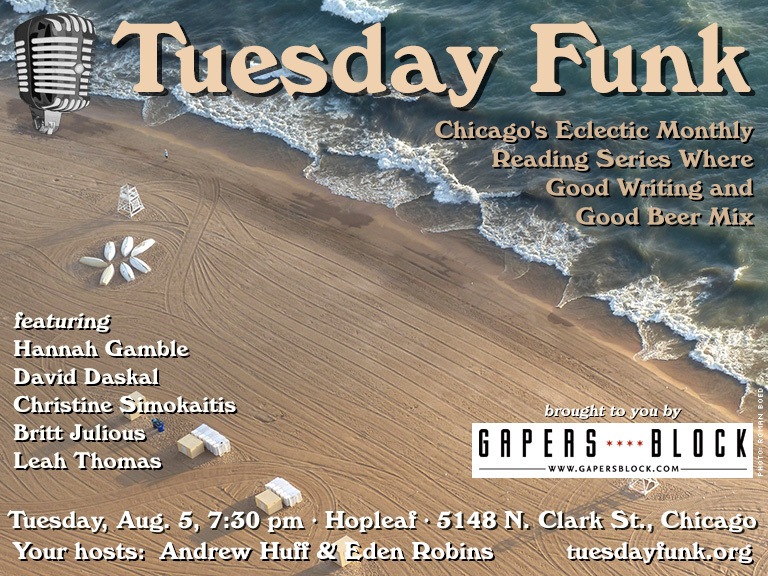 The reading gets underway on Tuesday, Aug. 5, 2014, at 7:30 pm in the upstairs lounge at Hopleaf, 5148 N. Clark St., Chicago. Doors open at 7:00 pm sharp -- no earlier, unfortunately, but get there as close to 7 as possible to secure a table, as the room fills up quickly. Grab a beer from Mark at the bar, and stick around afterward (or arrive earlier) for dinner downstairs. Admission is free, but you must be 21 or older. RSVP on Facebook and bring a friend. And hey, become a fan of Tuesday Funk on Facebook so you never miss an invitation to one of our readings. See you on Aug. 5! At the July 1st edition of Tuesday Funk, co-host Andrew Huff's topical haiku were typically diverse. is cool and foggy like this. Whoa. Just whoa. I am running out of exclamations for the amazingness of our readers. July was no exception. Why do you keep missing this show? Was it something I said? Come to the next one... I'll buy you a beer (I probably won't buy you a beer). Sheri Reda revved our engines with a funny/scary rant about food and the chemicals therein. Norm Doucet tugged at our heartstrings with a story of his post-9/11 experiences in the Marines. Co-host Eden Robins tried to pick up the pieces of our broken hearts with a micro-essay on her own cultural incompetence while traveling. And then Evan Okun blasted our minds and bodies to smithereens with his potent rhymes about justice and addiction and social injustice. Whew. It was time for a breather. Mark tried to keep up with our collective desire for liquor. After the break, co-host Andrew Huff skewered Rahm and SCOTUS alike with his haiku, and then Lisa White shared some totally relatable stories about internet trolls, and Lisa Kirchner finished us off with an excerpt from her memoir about living in Qatar. Like I said before. Whoa. Won't you come see us in August for another "whoa"-worthy show? We've got Hannah Gamble, David Daskal, Leah Thomas, Christine Simokaitis, and Britt Julious on August 5th! Reminder: Tuesday Funk #71 is tonight! Is there any better way to start off your 4th of July holiday than by listening to some great readers and drinking some cool refreshing beers? I'll just go ahead and answer that for you -- NO. So join us! Tonight, Tuesday Funk #71 features the likes of Lisa Kirchner, Evan Okun, Norman Doucet, Lisa White, and Sheri Reda! And, of course, everyone's favorite co-hosts: Andrew Huff and Eden Robins. 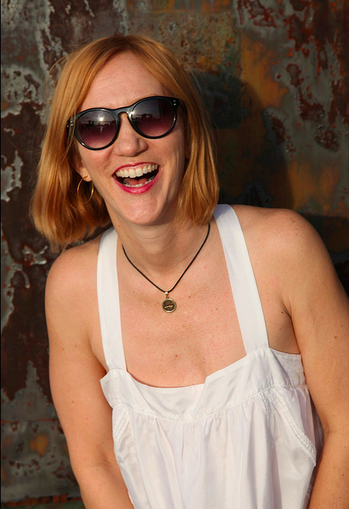 Lisa White is a born and raised Midwestern girl who's had numerous adventures and escapades writing. After moving here to attend college she fell in love with Chicago and despite a brief stint in New York returned to the city that feels like home. She cut her teeth writing about music and food around town for various outlets, including Heave, Gapers Block, IE and ChicagoStyle Wedding. She kinda went corporate for a while but like most writers never strayed far away from the clacking of laptop keys. 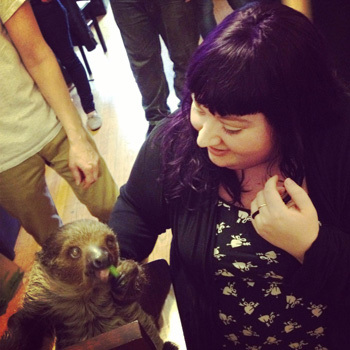 She now is the associate editor at Chicagoist where she spends her days writing and editing work about all aspects of Chicago life. Please join Lisa and all our other fantastic readers on Tuesday, July 1, 2014, upstairs at Hopleaf at 7:30 pm. This 21-and-older event is free. Norman Doucet hails from the den of the southern rebellion, Charleston, South Carolina. Influenced by the duality that exists there, he made some interesting decisions, starting with attending the college--founded after a slave revolt--which also has the dubious distinction of producing the two cadets who fired the first shots of the Civil War. 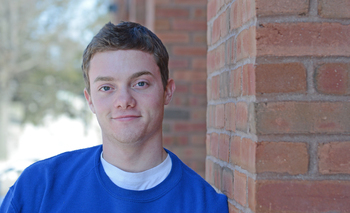 An English major as an undergrad, Norm decided to join the Marine Corps. He spent almost a decade there, earning his MA in English literature in the process. He loves telling stories, especially stories about those seminal moments that explain the duality that exists in most people. Please join Norman and all our accomplished readers on Tuesday, July 1, 2014, upstairs at Hopleaf at 7:30 pm. This 21-and-older event is free. Sheri Reda is a writer, editor, and Life-Cycle Celebrant who performs weddings, baby blessings, milestone ceremonies, and memorials for all comers. She has shared poems and stories and other ephemera at Czar Bar, Bop Shop, Soup and Bread, All She Wrote, Reading Under the Influence, Essay Fiesta, Here's the Story, The Skald, Storylab, This Much is True, Story Sessions, The Funny Story Show, and... places like that. Her written work has appeared most recently in Spirits Quarterly, American Book Review, Progressive Populist, HQ Poetry Quarterly, Oregon Literary Review, and enough textbooks to make her brain hurt. Please join Sheri and all our other fantastic readers on Tuesday, July 1, 2014, upstairs at Hopleaf at 7:30 pm. This 21-and-older event is free. Evan Okun/E. 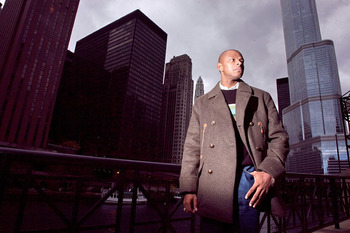 Oks is employed by Circles & Ciphers, a Chicago-based restorative justice group that uses hiphop to engage young men who are court- and gang- involved in critical discourse. He recently graduated from Wesleyan University (CT), where he majored in Sociology, received a Certificate in Education, and completed the PreMed track. In his last three years at Wesleyan, Evan volunteered in the music therapy department of the Connecticut Juvenile Training School, a nearby juvenile detention center, where he designed and implemented a class that examined literary technique and societal inequality through modern day hip hop songs. In the summer after he graduated, he served as a full-time employee of this facility, continuing his work with the music therapy department. Evan has published two hip hop albums, competed in the national collegiate spoken word poetry tournament, and runs a variety of writing workshops for youth ages ten to twenty. 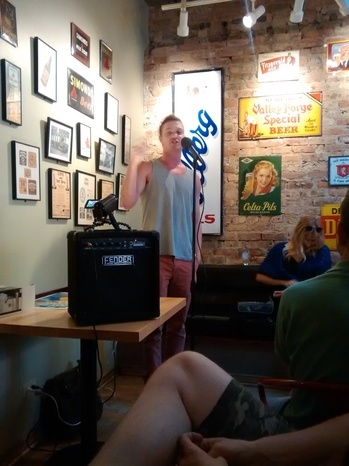 Please join Evan and all our other impressive readers on Tuesday, July 1, 2014, upstairs at Hopleaf at 7:30 pm. This 21-and-older event is free. Lisa Kirchner was once simultaneously the dating columnist for an alternative newsweekly, bridal editor for a society rag and the religion reporter for a gay and lesbian newspaper. Her new book, Hello American Lady Creature, is a darkly humorous memoir about getting everything she ever thought she wanted. 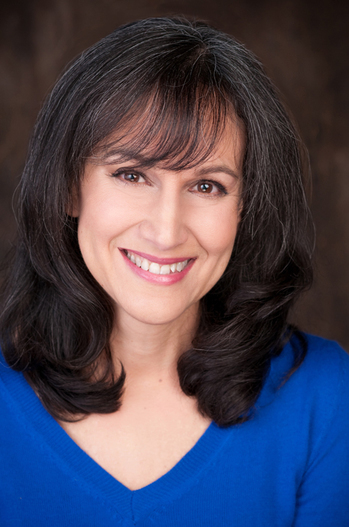 Please join Lisa and all our other multi-talented readers on Tuesday, July 1, 2014, upstairs at Hopleaf at 7:30 pm. This 21-and-older event is free. Three days before Independence Day, Tuesday Funk will celebrate its independence from genre! The 71st edition of Chicago's eclectic monthly reading series will feature Norman Doucet, Lisa White, Lisa Kirchner, Evan Okun and Sheri Reda. Andrew Huff and Eden Robins will stand defiant as cohosts. 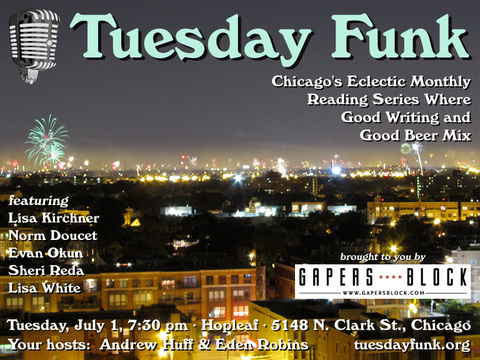 The reading gets underway on Tuesday, July 1, 2014, at 7:30 pm in the upstairs lounge at Hopleaf, 5148 N. Clark St., Chicago. Doors open at 7:00 pm sharp -- but not earlier, as much as we'd like to let you in. Arrive early for a table and grab a beer from Mark at the bar. Arrive even earlier or stay afterwards for a full meal downstairs. Admission is free, but you must be 21 or older. RSVP on Facebook and bring a friend. And hey, become a fan of Tuesday Funk on Facebook so you never miss an invitation to one of our readings. See you on the first of July!